For chocolate lovers, the Triple Choc Chip cookie has 3 times the chocolate and 3 time the taste. Covered with loads of chocolate chips on top as well as throughout the delicious chocolate cookie its a chocolate explosion. If your having a High Tea party then these are one of the favorites to place on your 3 tier cook platter. Bush Cookies are all about the taste, aroma and flavor. 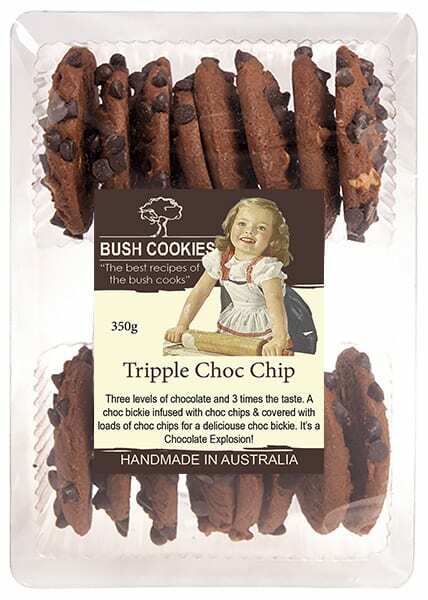 Sydney’s best wholesale biscuit bakery delivers wholesale orders of Triple Choc Chip ( and many other flavours), freight free, to grocery retailers and cafes in major metro regions. Order now from our parent company’s wholesale online fine food store Opera Foods. (Register and then log-in to see our wholesale prices).